Isidro was born in 1953—the same year that a revolution erupted in Cuba. Rebels wanted to overthrow then-president Fulgencio Batista, who left the island January 1, 1959, marking the end of the life that Isidro knew. Parades were held throughout Cuba, and many welcomed Fidel Castro as a bearded savior who would answer their prayers. Others, however, left as soon as they could. 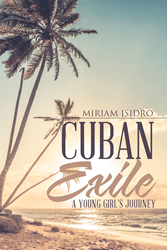 Based on her experiences as a young girl who fled Cuba, this personal and touching story takes the reader through Isidro's tumultuous journey to her new life in an unfamiliar country and culture, eventually leading her to the American Dream. Miriam Isidro is a naturalized American citizen who was born in Havana, Cuba. After overcoming many obstacles, she became a teacher and an elementary school principal. A Roman Catholic, Isidro is married with three children. Most of her writing is based on her own experiences.